Minneapolis (May 2012) – APEX® Siding System, an affiliate of Marvin® Windows and Doors, is introducing the nation's first fiberglass siding and trim system for residential and commercial applications. APEX Siding System has selected Above and Beyond Construction, to sell and install APEX siding and trim throughout the Twin Cities market. Above and Beyond Construction is one of the most respected remodeling firms in Minnesota, known for their professionalism and craftsmanship. The APEX siding system features Ultrex®, a patented, pultruded fiberglass material that delivers a beautiful finish, incredible durability, and is virtually maintenance free. APEX siding and trim has been designed based on more than 20 years of Marvin experience using Ultrex® pultruded fiberglass material in exterior building products. Proudly made in the United States, the APEX siding system incorporates an innovative use of a proprietary technology pioneered by Marvin -- proven in tens of thousands of homes across the United States. As a result, in every critical performance category (appearance, durability, strength, extreme temperature resistance, ease of installation, water management, cost of ownership and sustainability), APEX siding and trim outperforms vinyl, wood, steel, aluminum and even fiber cement. "We've begun to install APEX siding and trim on a number of homes in the Twin Cities area," said Arlo Cook, president, Above and Beyond Construction. "Our customers love the appearance of this product, as well as its durability and strength. It gives a home a real clean, crisp, sharp look. It definitely will increase the value of your home." Available in ten rich, bold, and enduring colors, APEX siding and trim offers clean, crisp lines and tight seams that separate homes sided with APEX house siding from those sided with fiber cement and even real wood. APEX siding material comes in 16-foot lengths, in either four-inch or seven-inch width sizes, and in a smooth or wood grain finish. "We believe APEX siding and trim is a game-changer, especially in Minnesota where the weather conditions are so harsh," Cook added. "This product is ready to take on anything Minnesota is ready to dish out. It's the new standard in siding. Anyone considering fiber cement siding should consider APEX siding and trim." To learn more about the APEX Siding System, visit www.apexsiding.com or call 888-215-1092. Click above to hear an ad that explains some of the advantages of Fibertec Windows. 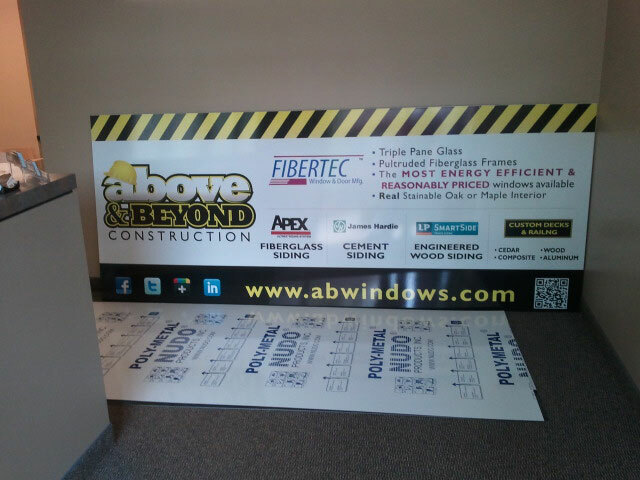 Exclusively available by Above and Beyond Construction in the upper midwest.